Free Shipping Included! Satya Jewelry Womens New Jade Gold Om Stretch Bracelet Set, Green, One Size by Satya Jewelry at Felicianeo. MPN: BG2-SET. Hurry! Limited time offer. Offer valid only while supplies last. Welcome the possibilities of each new day. 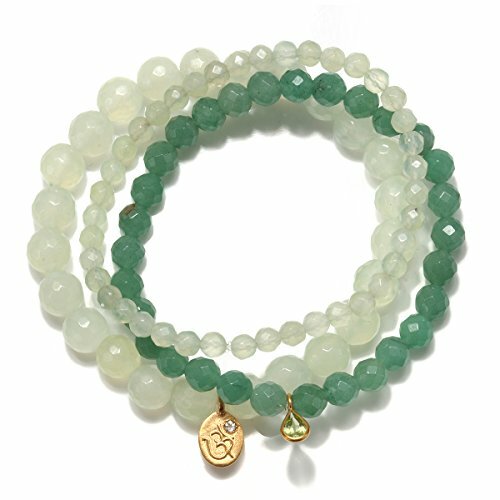 Stretch bracelet set of new jade and green aventurine stones features Om charm, sacred sound of the Universe. 4,6,8mm round new jade and green aventurine stones make up this 7-7.25 inch stretch bracelet set. Features 10x8mm Om charm. 18kt gold plate over brass. New Jade represents meditation, energy, and healing. Green Aventurine for balance, creativity. Om symbolizes the sacred sound of the universe.